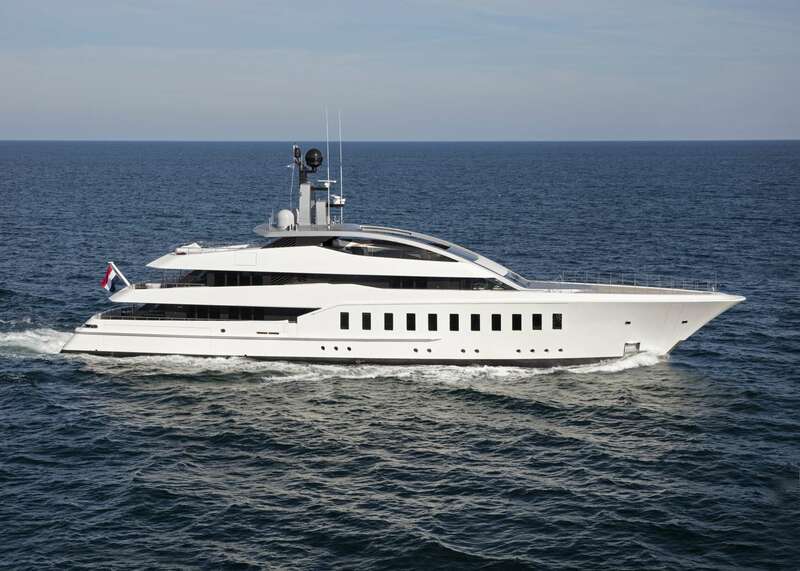 The large and elegant 57m/188ft custom superyacht by Feadship in 2015 and features a displacement hull constructed from steel with naval architecture from Eidsgaard Design. 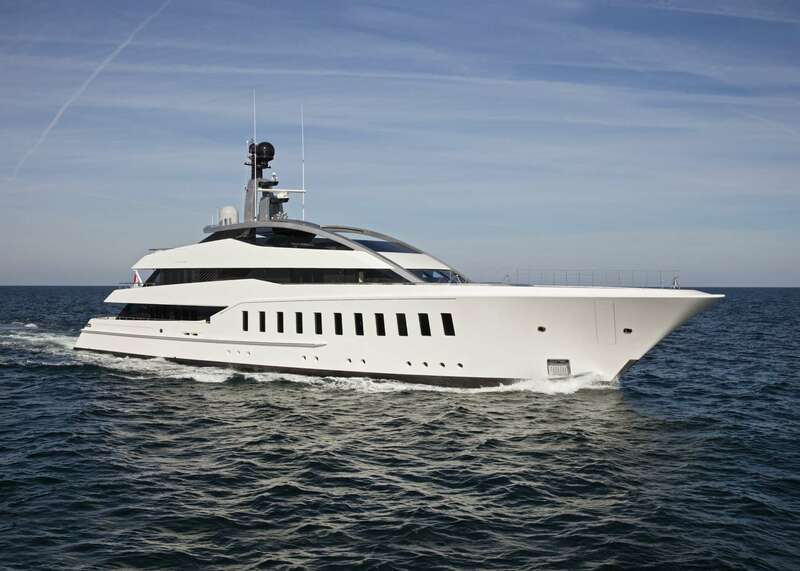 Bernardi Peschard is responsible for her elegant modern interiors, and the accommodation provides for up to 12 guests over six generous en-suite cabins, with a crew of 12 for efficient and discreet service. 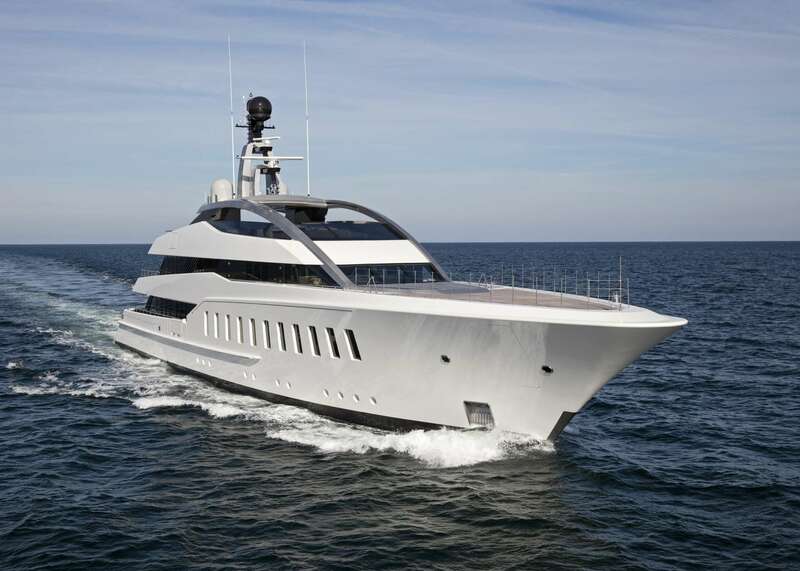 The transom door folds out to create a sizable swim platform where guests can sunbathe and relax beside the water and access the tenders and other water toys. A port staircase provides access to the main deck aft, where there is a pair of elongated sofas forming corner seating along the aft and starboard in addition to a pair of armchairs. A low-lying coffee table and stacked drinks tables provide convenience. On the upper deck aft, a grand rectangular dining table seats up to 12 guests beneath the sundeck overhang, and the aft area is furnished with a drinks table for six and a chaise-lounge with two armchairs around a coffee table. The foredeck is left clear for guests to use for sunbathing, observation or exercise such as yoga. 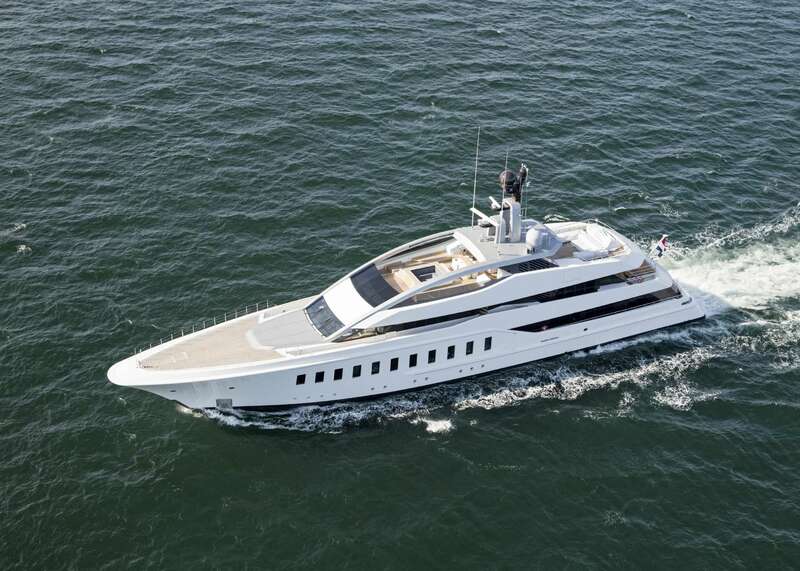 The sundeck offers the most amenities for the outdoor spaces on board, with the aft section providing a lounge comprised of three plush sofas and two stools around a coffee table, all of which can be shaded by two sizeable sun umbrellas. Forward of the lounge is an additional sun-exposed seating area with four chairs around a coffee table, and beneath the hardtop there is a shaded circular alfresco dining table. The curving wet bar has four stools and is placed in front of the dining area for convenient service to diners and guests relaxing in the raised Jacuzzi, forward of which is a broad sunbed that benefits from panoramic views. The interiors from Bernardi Peschard contrast light oak against a variety of dark wood types with bronze inlays for accents. The simple and clean modern appearance is enhanced by an abundance of natural lighting from the large windows spanning the length of the shared guest spaces, while guest cabins offer a comfortable and serene environment for uninterrupted rest and relaxation. The lower deck swim platform leads through to the toys storage area, forward of which is the dive store and side-loading tender garage to port and starboard. Aft of amidships is the engine room, followed by the crew mess, galley and facilities with the crew accommodation in the bow. The majority of the guest accommodation is located on the main deck, with the Owner's suite forward which is accessed via the private office. Within the bedroom there is a private lounge and his and hers bathrooms with walk-in wardrobes. Opposite the Master suite office, there is a gym accessible by all guests, followed by four VIP staterooms, two of which have beds convertible from queens to twins. Aft of the accommodation is the formal dining area, which seats up to 12 guests at a grand table. Immediately behind is the aft lounge, where two L-shaped sofas and an armchair are placed around a coffee table beside the windows on either side. A VIP stateroom can be found on the upper deck behind the wheel house, with the Captain's cabin adjacent on the starboard side. 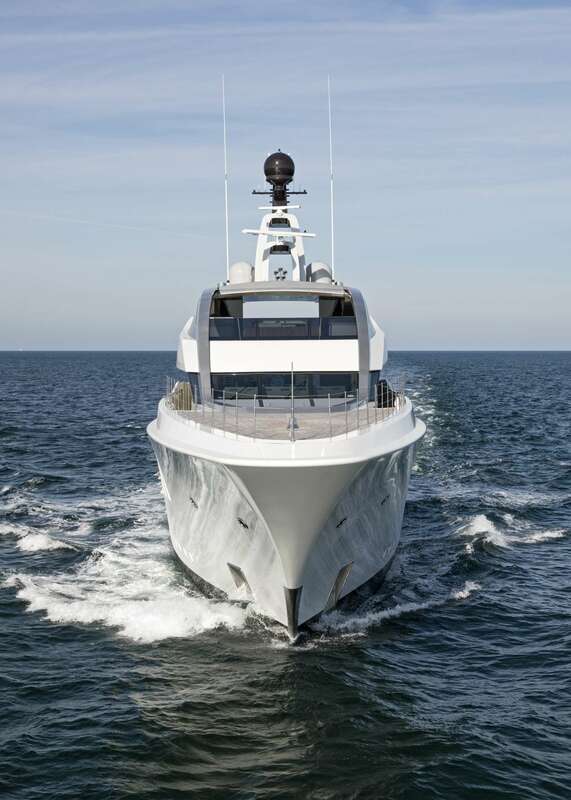 To the aft, there is a skylounge that contains a games table, an elegant bar and a casual lounge comprised of an L-shaped sofa and two armchairs around a coffee table, which is placed near the starboard windows. A pair of MTU 12V 4000M63 produces a top speed of 16 knots and a cruising speed of 14 knots with a range of 5,000 nautical miles. 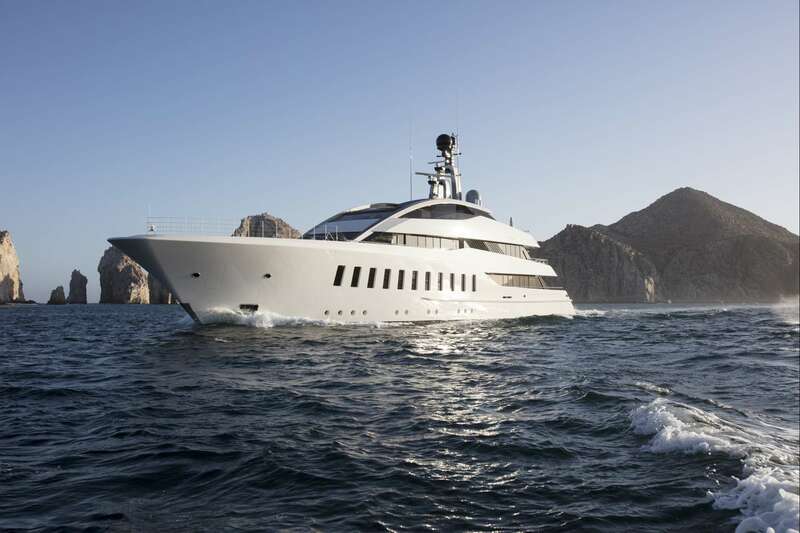 The accommodation sleeps a maximum of 12 guests across 6 en-suite cabins: 1 Master suite, 4 VIP staterooms (2 of which are convertible to twins) and 1 double cabin. The crew of 12 will ensure that everyone on board is well taken care of throughout their time on board. 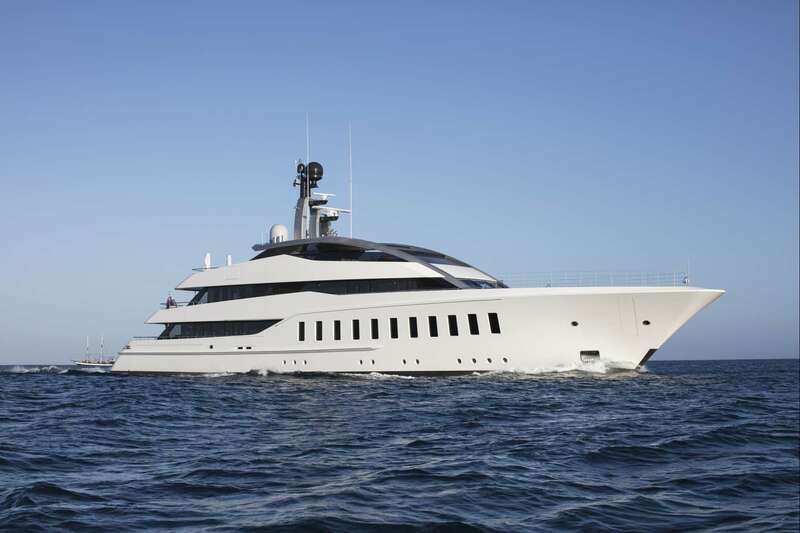 We do have available further amenity, owner and price information for the 57.45m (188'6'') yacht 57M CUSTOM SUPERYACHT , so please enquire for more information.